Our primary goals are for children to learn, from an early age, to appreciate and understand different cultures and to see the world from many different perspectives. 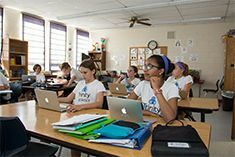 In Lower School, foreign language is taught through a variety of methodologies such as the communicative approach called AIM with the use of an innovative gestural technique. In Middle School, students choose either to study French or Spanish and continue with this language for their entire Middle School experience. This consistent immersion under the guidance of experienced native speakers is what makes our foreign language program so uniquely successful. Teachers design and select course content around the four skills of speaking, listening, reading, and writing. Students gain an understanding of historical, socio-cultural, and political issues and sensitivity to a wide array of cultural differences, whether in food, music, religion, or sets of ideas for any country where the target language is spoken. Our students’ exceptional performance on the National French and Spanish exams validates the success our program.